What kind of tv is that? Looks great, Cameron. How do you have the plasma mounted there? 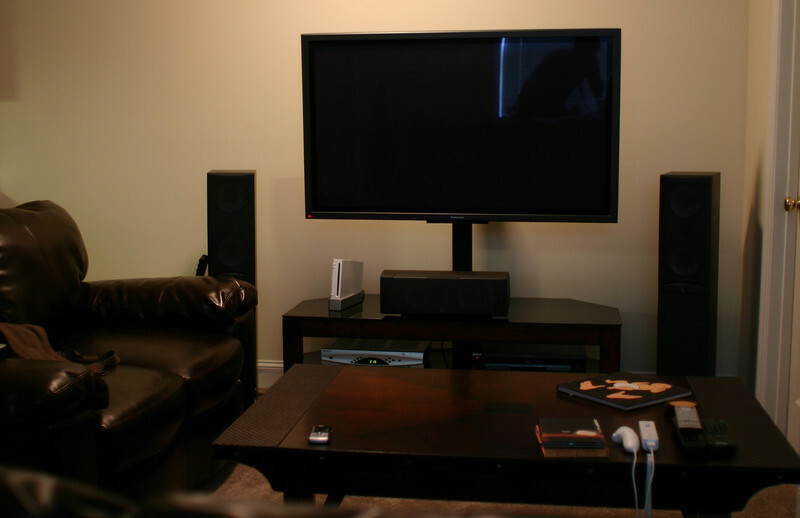 The mount seems to be floor standing and not part of the A/V unit - or am I mistaken? 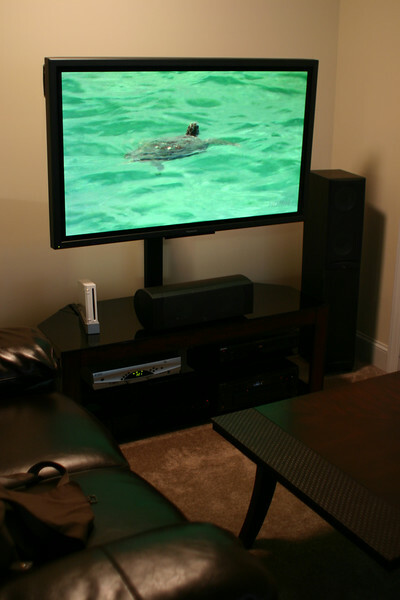 I've been having real trouble researching a 'floating' floor standing mount like that (if that is what it is) which can be partnered with a separately purchased a/v unit. One of Panasonic's commercial plasma displays. Ah ok I couldn't tell if it was a Panny or a Pioneer. Is that 1080p or 720? Sorry for asking questions but I'm in the market for a tv. I was just looking online at the TH-58PZ700U which is a 58" Panny 1080p plasma. They are dipping below $4,000 now which puts it near the $3,000 target I had set for myself before hunting for tv's. Looks like a gorgeous set. All you have is a Wii? LAME! You have my seal of approval, Cam. I really like the clean, minimalist look of it all. Those couches look pretty comfy, too I might add. How about some close up shots of the equipment rack? HDNet truly is one of the best channels out there. That is a really nice set up you've got there Cameron. I've seen that stand before, the PDP is mounted on that pole which is anchored to the back of the stand, there might be some sort of plate under the stand, but the one I just glanced at it was all one big unit. The mount and the rack are all one piece. I actually found that at Wal-Mart of all places, and it's probably the nicest thing I've ever seen/bought there. It's 720p. I love the thing. I bought it from Visual Apex and they have a new model out now that I think is cheaper than my set. Thanks Jeff. It's really dark, but there's an XBOX and PS2 down on the bottom shelf Couches are new as well. I'll get some close up shots of the rack, but there's nothing special down there as Im running a Sony DA-30ES which is about 8 years old as well as a DVD player that's about the same age (Panny RP-91 broke recently). Speakers are all Infinity and I've had them for a long time as well. I really like the setup compared to what I've had to deal with before, but Im currently an apartment dweller and the space is a little cramped. 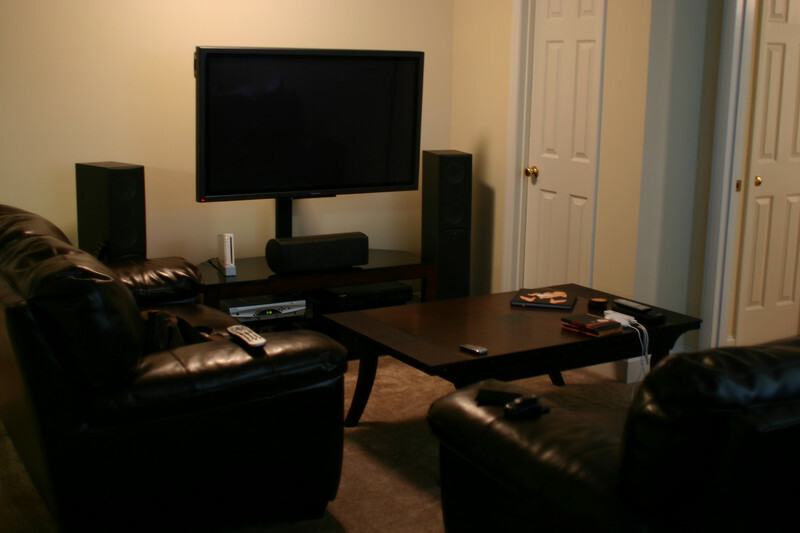 You can tell that the table is almost too big for it's space and the love seat is almost too close to the TV. Other than that, it's great. Thanks for clearing that up. 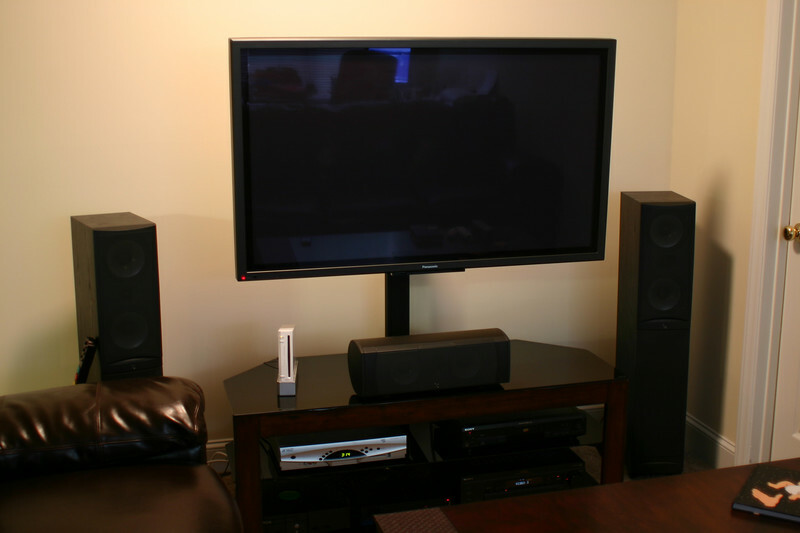 I?ve seen a number of A/V units with the floating mount built in like that here, but none of them are right for the shelf space I require and I?ve found that many are not built to hold 50inch plasmas.